Forrás: Metro. Szerző: Nicole Morley. 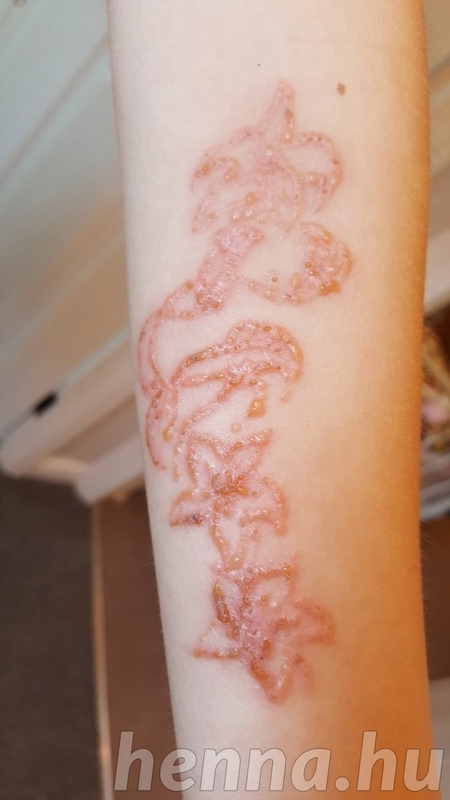 This mum is warning parents of the dangers of black henna after her daughter’s ‘holiday treat’ turned into a blistered burn that could scar for life. 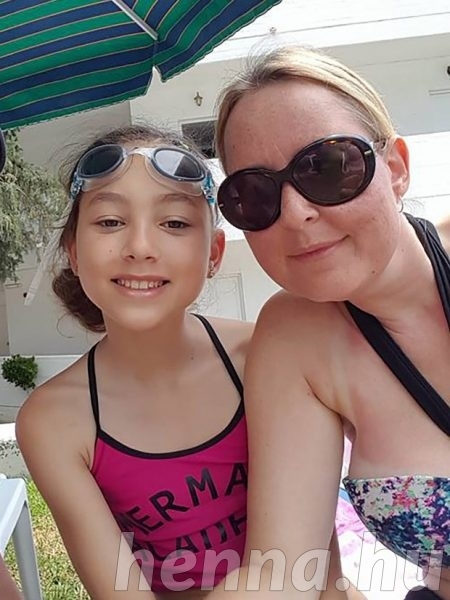 Schoolgirl Teigan, 13, was thrilled when her mum Kirsty Koorts, 41, agreed to let her get a temporary henna tattoo on a family holiday to Faliraki, Greece, last month. 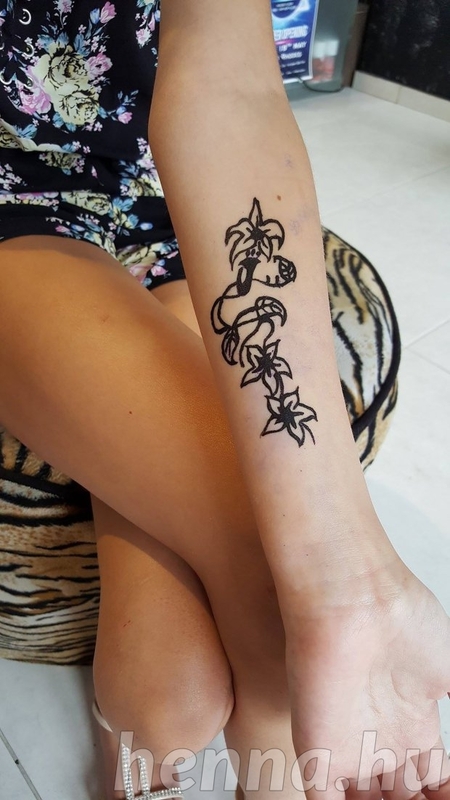 After finding a shop on the island that offered black henna, Teigan settled on a floral design in the ‘weakest’ strength of black henna, which Kirsty claims they were told would last one month. Unaware of the difference between henna, a natural dye from the henna plant, and black henna, a chemical substance, Kirsty wasn’t concerned about letting Teigan get the temporary tattoo. Just two days after getting home to Evesham, Teigan’s henna started to itch and burn and the pattern soon turned into an infected wound covering the teen’s entire left forearm. After a month of watching her daughter endure a ‘living nightmare’ and learning that the chemical burns could affect Teigan for life, Kirsty is determined to warn others about black henna. For weeks after getting the so-called temporary tattoo, Teigan’s skin blistered, burned and oozed with infection so Kirsty and Teigan’s dad Scarl Koorts, 36, took their daughter to her doctor where she was prescribed antibiotics. However, Teigan’s burns were so severe that after three weeks they still had not improved so the teen was taken to A&E where she was put on a strong antihistamines and a steroid cream. While henna is a natural dye prepared from the Lawsonia inermis plant black henna is a chemical substance called para-phenylenediamine (PPD) which is found in hair dye. The PPD in black henna can cause an allergic reaction which leads to chemical burns and a possible life-long sensitivity to the chemical which is used in most hair dyes. Medics have claimed the teen’s scars should start to clear up after six months but warn there is ‘no way to be sure’. Kirsty said: ‘The doctors have told us it will be visible for six months but there is no way of knowing, everyone’s skin is different. She could be scarred for life. Dr Anjali Mahto, Consultant Dermatologist and British Skin Foundation spokesperson, said: ‘Black henna is well known to cause skin reactions and should be treated with caution, particularly in children. ‘Year after year we see ever more severe reactions to black henna tattoos. ‘What might seem like pretty body art can quickly turn nasty with horrific blistering, permanent scars and even in the most severe cases life-threatening allergic reactions. Metro.co.uk has previously spoken about ‘black henna’ with Ash Kumar, a world-renowned mehndi artist who has been in the business for around 17 years, whose work has featured in major Hollywood and Bollywood films and even won him a Guinness World Record. Ash also advised how to tell the difference between natural henna and its harmful synthetic counterpart, read more here.